How can I change the text of the clear form button? Does this still work? Whenever I paste into the text (I notice it's been renamed) section the code just disappears. It's now possible to do this in the form builder. 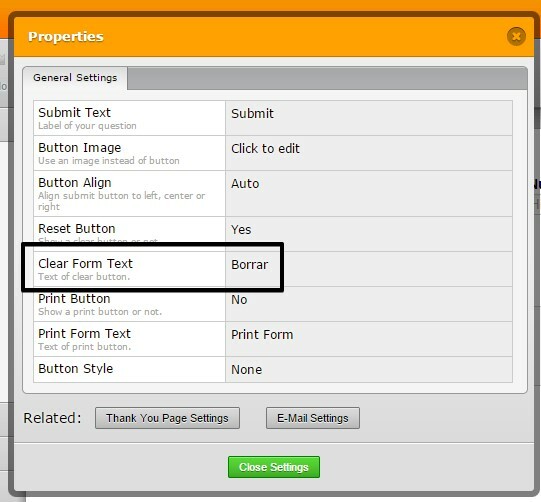 You just need to right-click the submit button, enter the Properties screen and modify the text accordingly. Let us know if this is what you're looking for. Ah, sort of, I was hoping to change the behaviour of the button as well as the text so that it took people to a different webpage. I'm guessing scripts are no longer supported from the Text area? OK, I've bodged it here: http://resources.citygatechurch.net/community/commgroupform.html?hi=Tracey%2C%20Emma%20and%20Cathy by downloading the source but the Jotform code keeps trying to make any buttons I add into submit buttons. I've sort-of gotten around it by making the button clear a required field (so the form can't submit) but it looks a bit weird to the user just before they're redirected. Do you know of any way to stop all buttons becoming submit buttons? I'm sorry for the tests. The cancel button redirects me to http://resources.citygatechurch.net/community/communitypage.html. I think you would like it to clear without the popup? Let us know. Yup, that's what I'm going for. I'm not really interested in clearing the form, I'm just trying to hijack the button to direct people back to where they've come from. If you want to see the whole thing in context then the two pages you've seen sit in an iframe here: http://www.citygatechurch.net/church-life/community-groups/ (the form can be found by going: "The Groups">"General Community Groups">Any of the "Contact The Group" buttons). It's currently working but the "Cancel" button I've set up makes the form flash red briefly before the redirect happens - that's what I'm trying to avoid. Flashing red is shown because the field validation is being executed right before you make a change. I believe that you will not be able to cancel it as it is because of bubbling effect. Feel free to contact us anytime, should you require our assistance.